We have highly skilled developers that can bring your site up to date and add that custom touch you always wanted. Evolve Studio has been developing WordPress websites for more than 8 years now. WordPress powers almost 30 % of websites, making it the platform of choice for many bloggers, marketers, e-commerce operators, etc. 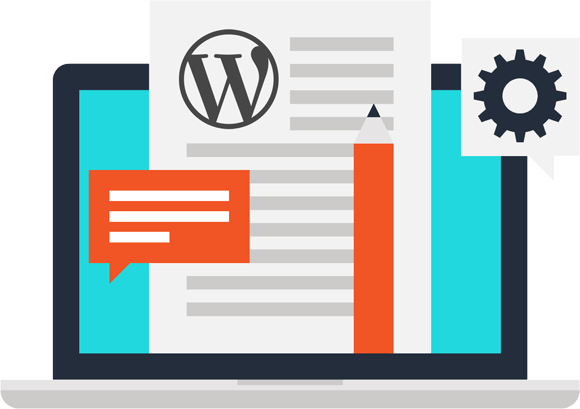 It doesn’t matter if you’re a blogger who is just starting out or a marketer in need of a flexible tool; WordPress has proved itself time and time again to be the most trusted Content Management System ( CMS). What’s best, you won’t ever have to worry about hidden charges, even if your website’s popularity increases beyond your wildest dreams. WordPress will always be free for you to use. Most important, WordPress is open source. You can alter your code if you need to, any time, without having to spend a single dime. You might also make changes to your WordPress website without knowing programming. That’s perhaps the best thing about WordPress. One of the most sought-after features in a Content Management System (CMS) is flexibilty, which WordPress has it. No matter what you’re using WordPress for – whether as a personal blog or to a popular ecommerce site, WordPress is versatile enough to meet any and all of your needs through its extensive features and extensions. Google and all search engines show and rank websites in search results based on predefined parameters. The more parameters you fill, the better your website is ranked in the search results. The good news is that WordPress takes all the SEO responsibilities a CMS needs to meet. Better yet, there are various SEO plug-ins that can help improve visibility in your site’s search engines. WordPress is growing fast and one of the main reasons is that it’s easy to use. Just a few clicks and the WP is ready for use. There are pre-installed themes and plugins for article writing and publishing, user management, comments, RSS feeds, reviews, and much more. Once installed, you can start creating and publishing blogs and pages, and make personalized settings without having to program. Plus, you can read a step by step guide on how to use WordPress, which will make it easier for your to navigate your website. You can log in as wordpress admin and alter content to meet your preferences. Being the largest and most effective community, WordPress is growing day by day to improve its user interface and features. Over time, WordPress improves its system every time with the latest version. The most optimal feature of SEO, large amount of WordPress users, expanded and customizable panel and much more. WordPress is probably the best CMS to be for your future business website. WordPress has a high standard of security. But because 23% of websites are built on it, hackers are constantly trying to find access to WordPress to access the sites built on it. But do not worry: regular updates provided by WordPress strongly protect you from these attacks. Regular updating of your WordPress version is quite effective in fighting this vulnerability. Because of the thousands of plug-ins and themes that WordPress has offer, with just one click of a button you can customize your site to appear and function as you would like. Furthermore, because of the seemingly endless number of features that WordPress has to offer, you can create the website or blog that you’ve always wanted. You can use WordPress for your online store, blog, etc. WordPress features a universal platform. The WordPress dashboard always looks the same – no matter what you’re using WordPress for. You don’t need to hire experts or spend an excessive amount of time trying to figure out how to use WordPress. In fact, anyone with some sort of general PHP and MySQL experience can use WordPress immediately. Thanks to our support, you don’t even need that since we have the right experience to help you get the most out of WordPress. We will install any free or premium WordPress theme and make it look like a demo site. Thanks to our extensive experience in installing different WordPress themes, you will not have to do anything. All you have to do is very simple: select the theme you like most and we will take it from there. Everything ‘WordPress’ is our strong suit, and we endeavor to offer you WordPress theme customization services that lets you transform your themes to solutions that are all-inclusive, versatile, and riveting. While tailoring your themes to suit your business sensibilities, we take every measure to keep it responsive and compatible across different platforms. Without falling prey to the mainstream and hardly effective ways of theme customization, we deliver services that make this customization a pleasant romp. You'll start off by having a website. Of course, we can install and set up as many plug-ins you want or need, including contact form plug-ins which come may come in handy. We will securely move your entire WordPress site, emails and databases to your new hosting account. We will inform you about the web host of choice and everything that has to do with hosting your WordPress site.